Western Digital reveals the Scorpio Blue 1TB, a new laptop HDD with a standard thickness of 9.5mm. Western Digital® (NYSE: WDC), a leader in the desktop, mobile, high-capacity enterprise and consumer markets for hard drives, today announced that it has commenced volume shipments of its WD Scorpio® Blue™ 9.5 mm, 2.5-inch mobile hard drive with 1 TB capacity. Designed for mainstream notebook computers, the new WD Scorpio Blue 1 TB hard drive utilizes 500 GB-per-platter areal density and is now available in the highest capacity for 2.5-inch hard drives in the industry-standard 9.5 mm, two-platter (2-disk) form factor. WD Scorpio Blue mobile hard drives are designed with ruggedness, reliability and data-protection features that actively watch over valuable data. The WD Scorpio Blue 1 TB mobile hard drive also achieves excellent power and performance, making it an ideal solution for notebook computers and other portable devices that require extended battery life and cool, ultra quiet operation. "With the release of the 1 TB WD Scorpio Blue notebook drive in a 9.5 mm package, WD is able to offer the greatest storage capacity available for use in portable computing environments," said Matt Rutledge, vice president and general manager of Client Storage for WD. "Mobile users no longer need to choose maximum capacity over thin and light, WD is ready with storage options, achieved without compromise to performance and reliability, that prove ideal for mobile digital devices of all kinds including PC and Mac notebook computers; external storage; and digital media players." Low power consumption – Advanced power management features and algorithms optimize the way the drive seeks for data, which significantly improves power consumption. Cool and quiet - In a notebook drive, silence is golden. WD's exclusive WhisperDrive™ technology yields one of the quietest 2.5-inch hard drives on the market. Reliable – WD's SecurePark™ parks the recording heads off the disk surface during spin up, spin down, and when the drive is off. This ensures the recording head never touches the disk surface resulting in improved long term reliability due to less head wear, and improved non-operational shock tolerance. Shock Tolerant – WD's ShockGuard™ technology, now increased to a best-in-market 400Gs shock specification, protects the drive mechanics and platter surfaces from shocks. Advanced Format (AF) - Technology being adopted by WD and other drive manufacturers to continue growing hard drive capacities. New drives featuring AF are optimized for operation with the following operating system software: Windows® 7, Windows Vista™ and Mac OS X Tiger®, Leopard®, Snow Leopard® (PVT models only). Tested for compatibility - WD performs tests on hundreds of systems and a multitude of platforms in its FIT Lab™ and Mobile Compatibility Lab to give customers confidence that drives will work in specific systems. 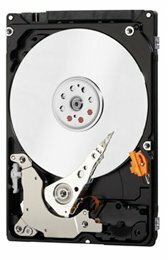 Shipping now through select distributors and resellers, the WD Scorpio Blue 1 TB (model WD10JPVT) hard drives are covered by a three-year limited warranty and have a Manufacturer's Suggested Retail Price (MSRP) of $139.00 USD.